A new Internet.org initiative is being launched to make the Internet "available to every person on Earth." The effort is being spearheaded by Facebook, in partnership with Ericsson, Qualcomm, Mediatek, Opera Software, Samsung and Nokia. The partners plan to explore solutions in three major opportunity areas: affordability, efficiency, and business models. 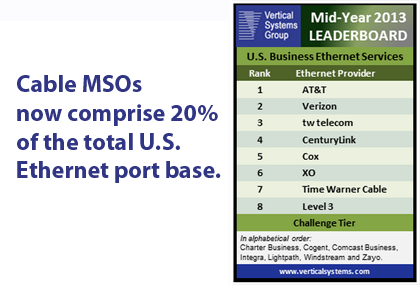 Cable MSOs are making advances as providers of business Ethernet services and now comprise 20% of the total U.S. Ethernet port base, according to Vertical Systems Group's latest U.S. Ethernet Leaderboard. The Incumbent Carrier segment remains the largest, with 47% of total U.S. Ethernet ports, followed by the Competitive Provider segment (33% of ports). Vertical Systems Group's U.S. Ethernet Leaderboard are as follows (in rank order based on port share): AT&T, Verizon, tw telecom, CenturyLink, Cox, XO, Time Warner Cable, and Level 3. Port shares for mid-2013 were calculated using Vertical's base of enterprise installations, plus direct input and other data from surveys of Ethernet Service Providers. To qualify for the Leaderboard, a provider must have four percent (4%) or more of billable retail port installations. The following seven Ethernet providers have the next highest mid-2013 port shares and have achieved a position in the Challenge tier (in alphabetical order): Charter Business, Cogent, Comcast Business, Integra, Lightpath (formerly Optimum Lightpath), Windstream, and Zayo Group (includes AboveNet and other acquisitions). To qualify for the Challenge tier, a provider must have 1% or more of billable retail port installations. "During this reporting period, the Cable MSOs showed very strong market penetration. For the first time, the Cable MSO segment had more new Ethernet port installations than the Incumbent Carrier segment," said Rick Malone, principal at Vertical Systems Group. "Competition was heaviest in the mid and small business sectors served by MSOs and regional CLECs, resulting in very favorable pricing for customers." Leaderboard changes for the period include XO moving up to sixth position, Time Warner Cable moving up to rank seventh, and Level 3 dipping to eighth position. The eight Leaderboard companies as a group lost more than 2% market share to smaller competitors during the first half of the year. A larger percent of retail Ethernet ports are being sold using wholesale and other channel partners. Ethernet providers cited an uptick in demand for connectivity to Private Clouds using Ethernet Private Lines (EPLs) and Ethernet Virtual Private Lines (EVPLs). The fastest growing offerings during the period were Ethernet access to IP/MPLS services and Cloud connectivity. The Market Player tier includes all other providers selling Ethernet services in the U.S. Companies in the Market Player tier include the following providers (in alphabetical order): Alpheus Communications, American Telesis, Bright House Networks, BT Global Services, Canby, Cbeyond, Cincinnati Bell, Consolidated Communications, Earthlink Business, Expedient, FairPoint Communications, FiberLight, Frontier, IP Networks, Lightower (includes Sidera Networks), LS Networks, Lumos Networks, Masergy, Megapath, NTT America, Orange Business, Reliance Globalcom, Sprint, SuddenLink, Tata, US Signal, Virtela and others. 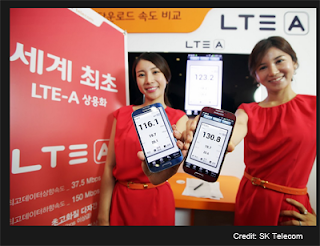 SK Telecom is expanding its LTE-Advanced commercial service network, via its local entity Ericsson-LG, to downtown areas of 84 cities nationwide, including the entire Seoul metropolitan area and six other major cities. The carrier launched its commercial LTE-Advanced service earlier this summer, offering up to 150Mbps mobile broadband speeds, twice that of LTE. The initial launch included the entire Seoul area, the downtowns of 42 cities in Gyeonggi-do and Chungcheong-do provinces, and 103 campus towns. The carrier plans to deploy 32,000 LTE-Advanced base stations by the end of the year, which will cover 84 cities nationwide and approximately 300 college campuses. Ericsson confirmed its major role in the upgrade, providing the software for Carrier Aggregation and multi-carrier technology for the B5 (850MHz) and B3 (1.8GHz) bands in South Korea’s southeastern regions, where Ericsson partnered with SK Telecom for the LTE network deployment and commercial service launch in 2011. Jan Signell, Head of Region North East Asia, Ericsson, says: "We are proud to power SK Telecom’s LTE-Advanced network, which now covers major areas of the nation. SK Telecom will be able to offer its users broader network coverage and an enhanced mobile broadband experience, ensuring continued loyalty among its customers and market leadership. Ericsson will keep collaborating with SK Telecom to exceed increasing user expectations in South Korea." Hibernia Networks announced two new Points of Presence (PoP) into Telecity Group’s 8/9 Harbour Exchange London and Gutleutstrasse, Frankfurt data centers. 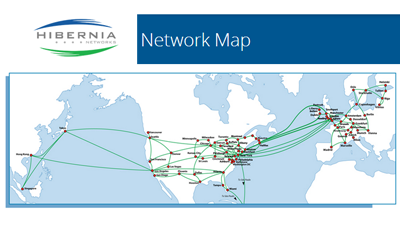 Hibernia will now deliver Ethernet and Wavelength services from 2Mbps to 100Gbps at these locations. Hibernia can provide carriers, ISPs and enterprise organizations two new venues that enable Amazon Web Services (AWS) and LINX (London Internet Exchange) connectivity in London and Global Peering Solutions for members of DE-CIX (Deutscher Commercial Internet Exchange) in Frankfurt. The carrier said its network engineering bypasses the high-demand London backhaul routes by travelling from North America to Amsterdam, Frankfurt and Paris directly. From Europe, Hibernia also provides diverse routes that can bypass New York City and Chicago into Montreal and Toronto. Hibernia now provides access to over 170 points of presence across North America, Europe and Asia. AT&T estimates that U.S. commercial buildings with cooling towers could collectively save up to 28 billion gallons of water annually by upgrading systems and relying more on free cooling techniques. This is equivalent to the amount of water that more than 765,000 Americans use at home in a given year. 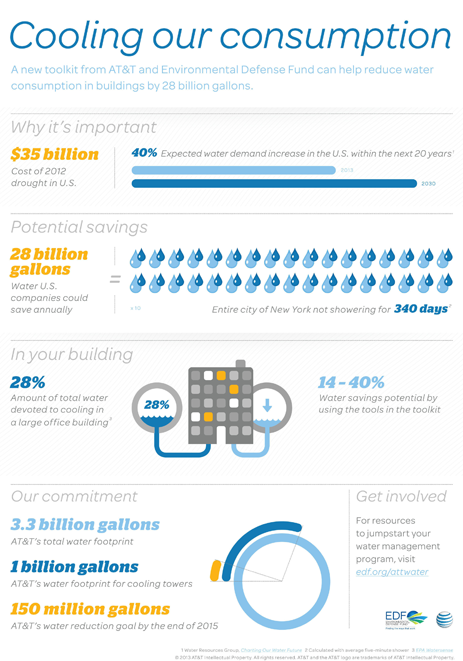 The water savings could range from 14-40% of overall building usage, according to the study conducted by AT&T and Environmental Defense Fund (EDF). For its own operations, AT&T upgraded one cooling tower filtration system upgrade at a cost of under $100,000. This change promises more than $60,000 in annual water and sewer savings—paying for itself in less than two years. Another minor $4,000 equipment upgrade to expand free air cooling promises nearly $40,000 in annual savings. 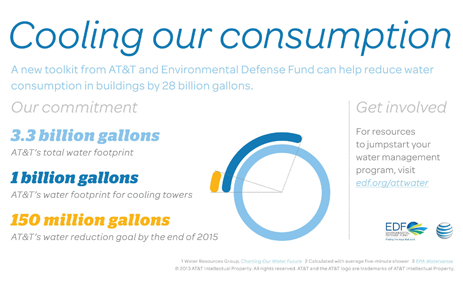 AT&T has now set a target to to reduce its approximately 1 billion gallon annual cooling tower water use by 150 million gallons per year by 2015. 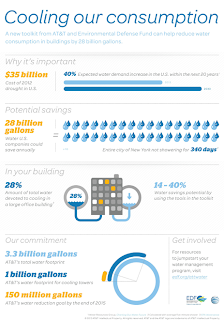 Cooling tower water use accounts for approximately 30 percent of AT&T's 3.3 billion gallons of annual water use. AT&T and Environmental Defense Fund are releasing a Building Water Efficiency toolkit to help others implement these best practices. "People knew these cooling systems use a lot of energy, but nobody had ever focused on how much water they guzzle, or how we could reduce that 'aqua-print,'" said Tom Murray, Vice President of Corporate Partnerships at EDF. "Even we were surprised by what we were able to achieve with AT&T. It's a huge opportunity for companies to save water, save money and help out the communities where they operate." "Thirty-one of our top water consuming facilities are in water stressed regions," explained John Schinter, AT&T Executive Director of Energy. "We couldn't wait until a drought put a strain on our operations; we needed to manage risk from water scarcity and increasing water costs today. EDF helped us find ways to do so that were good for the communities where we operate and that were financially sound." Dobson Technologies, an Oklahoma-based provider of business and residential telecom and transport services, as well as cloud data center services, has deployed Cyan's Z-Series packet-optical transport platforms (P-OTPs) across its major markets and has turned-up Cyan's Blue Planet software-defined networking (SDN) system. The Cyan solution comprises Z77, Z33 and Z22 packet-optical platforms deployed in roughly 40 markets supporting Dobson's telecom and transport services. The solution also includes Blue Planet applications Planet Design for network design functions, Planet Operate for network and service orchestration functions, and Planet View, which provides customers with visibility into and control over their services. "We are seeing a number of demands, primarily from wireless backhaul, business Ethernet, and data center customers, that have challenged our network resources and operational model. 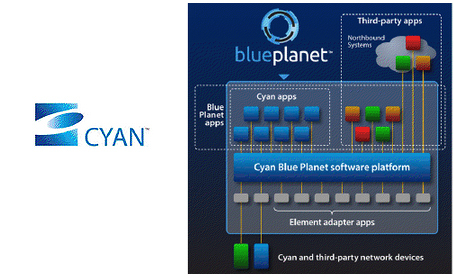 The Cyan Z-Series platform allows us to cost effectively address those demands. But to truly get ahead of the curve and proactively offer compelling and profitable new services requires sophisticated software such as Cyan Blue Planet, which will help us create an entirely new customer experience," sated James Rutherford, Dobson president of network operations. The market for VoIP and IMS solutions surged 30% in 2Q13 boosted by VoLTE spending in North America, according to Infonetics. "IMS equipment has officially moved into an LTE and voice-over-LTE world, and there’s no going back now,” notes Diane Myers, principal analyst for VoIP, UC and IMS at Infonetics Research. “In the second quarter we saw this impact spending on session border controllers and IMS core equipment for VoLTE access and interconnection (LTE to 3G) buildouts. Though LTE- and VoLTE-related equipment sales are growing, the market will continue to be lumpy from quarter to quarter." 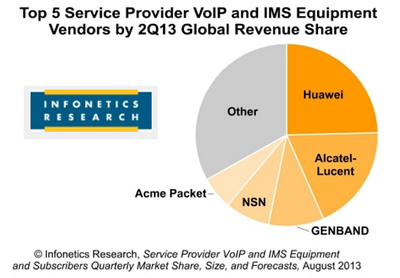 Meanwhile, Huawei, Alcatel-Lucent and Genband remain atop the VoIP and IMS market share leaderboard. The market for 10-Gigabit Ethernet (10GbE) has returned to strong growth, posting double-digit increases in both revenues and shipments for the second quarter of 2013, according to the recently published Server-Class Adapter & LAN-on-Motherboard (LOM) Report from Crehan Research. The report shows that the 10GbE growth was broad-based, with both the adapter card and LOM/controller segments posting increases. "The demand for high-speed server networking rebounded strongly, with both enterprise and public cloud/web-scale data center customers upgrading existing networks as well as building out new networks to handle increased traffic demands and application workloads," said Seamus Crehan, president of Crehan Research. 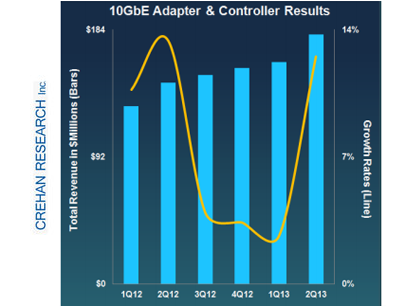 “The strong rebound propelled the 10GbE market to new highs,” he added. In parallel with the strong 10GbE growth seen in the server-class adapter and LOM market, Crehan anticipates that the data center switch market will also post robust results on the strength of record 10GbE deployments. "The recent introduction of numerous software-defined 40GbE- and 100GbE-capable data center switches for core and aggregation deployments seems to be giving customers more comfort in deploying 10GbE server access switches," he said. The U.S. and Canada have agreed on three interim spectrum sharing arrangements covering a range of wireless communications operations along the U.S.-Canada border. 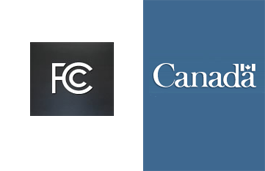 The agreements, which were negotiated by the FCC and Industry Canada, govern the sharing and coordination of spectrum in the 71-76 GHz, 81-86 GHz, 92-94 GHz and 94.1-95 GHz bands. The agreement also covers general aviation air-to-ground communications services, and more efficient use of spectrum for specialized mobile radio services. "The arrangements announced today will help pave the way for improved wireless broadband deployment along the U.S.-Canada border for consumers and businesses, among other multiple public and commercial benefits. The arrangements are also critical to maximizing interference protection for commercial licensees operating along our common border with Canada, and will also promote more efficient use of spectrum. The arrangements were reached as a result of a collaborative effort by the FCC, the State Department, NTIA and Industry Canada," stated Mignon Clyburn, acting FCC Chairwoman. Columbus Networks, which operates a number of undersea cables across the Caribbean, has upgraded its network with the Juniper Networks T4000 Core Routers to meet rapidly expanding bandwidth requirements for hosted services and multimedia applications, including mobile, video, cloud and research. 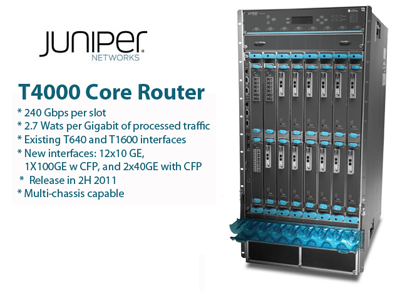 The upgrade extends and enhances the existing Juniper Networks T1600 core routing infrastructure in the network. Financial terms were not disclosed. Columbus Networks, with its joint venture partner CWC Wholesale Solutions, operates more than 26,000 miles of subsea fiber. "Our priority is to exceed customer expectations as our network continues to experience continuous growth. As we evolve the Columbus IP network and realize the capabilities of the T4000, Juniper has been a critical technology partner enabling us to reduce our operational expenditures while also increasing our performance, reliability and efficiency," stated Paolo Autore, engineering manager, Columbus Networks. XO Communications announced an expansion to Canada. Its Canadian subsidiary will now offer route-diverse, high-speed network services across all of Canada's six time zones. XO network services are now available throughout Canada, including Dedicated Internet Access, high-speed IP transit, MPLS IP-VPN, VPLS, Ethernet, Private Line and Wavelength services for enterprise and wholesale customers. "Our Canadian expansion is an example of the progressive organic growth we've experienced since implementing our initial network hub in Toronto and the growing demand from our customers for end-to-end network service capabilities throughout Canada," said Don MacNeil, chief marketing officer for XO Communications. "Our further expansion across Canada will enable XO Communications to continue to provide high-capacity network services to enterprise and wholesale customers, whether they need connectivity within Canada or high-speed access to markets in the U.S."